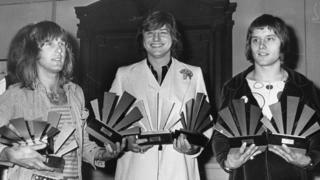 Keyboardist Emerson died of a self-inflicted gunshot wound, coroners in the US said. Lake's manager Stewart Young wrote on Facebook: "Yesterday, December 7th, I lost my best friend to a long and stubborn battle with cancer. "Greg Lake will stay in my heart forever, as he has always been." "Another sad loss with the passing of Greg Lake," wrote Rick Wakeman, keyboardist in prog rock band Yes. "You left some great music with us my friend & so like Keith, you will live on." It set a standard for progressive rock and received a glowing, well-publicised testimonial from The Who's Pete Townshend, who called it "an uncanny masterpiece". But within a year, founding member Mike Giles quit and Lake refused to work with the band - although he stuck around long enough to sing on their second album, In the Wake of Poseidon, which was criticised for treading old ground. Unusually, the band combined heavy rock riffs with a classical influence. They scored hit albums with Pictures at an Exhibition, Trilogy and Brain Salad Surgery - many of them produced by Lake himself. Tarkus, released in 1971, featured an opening track inspired by the fictional Tarkus character - a half-tank, half-armadillo creature that would appear on stage at gigs - that lasted more than 20 minutes. The band went on to enjoy chart success in 1977 with their version of Aaron Copland's Fanfare for the Common Man. ELP's ambitious light shows and on-stage theatrics were the epitome of '70s rock excess, and several punk acts cited ELP as one of the bands they were reacting against. "The greatest music is made for love, not for money," Lake is quoted as saying on his official website. "The early ELP albums were pioneering because there is no standing still; time is always moving forward."